The national stage doesn’t appear to have fazed Jim Sias. The Yukon men’s skip has led his team to an early 3-2 record – including wins over powerhouse curling provinces Alberta 9-7 and Manitoba 8-6 in an extra end – at the 2015 Travelers Curling Club Championships in Ottawa this week. All games are eight ends. Sias, 39, is curling in his first national championship alongside third Greg Thom, second Lee Malanchuk and lead Brad Wilson. The team beat another powerhouse, Northern Ontario, 6-4 last night before losing to New Brunswick 6-3 early today. Their previous loss came against British Columbia 8-2. Yukon is currently tied for second with B.C. and Northern Ontario at 3-2 heading into their final game versus Northwest Territories this afternoon. The Travelers championship will conclude with playoffs tomorrow followed by the finals Saturday morning. Six teams will make the playoffs in both men’s and women’s play. Saskatchewan is the defending champion on the men’s side, while Ontario is the current women’s titleholder. Sias said his team is trying their best to soak in the moment and festive atmosphere at the Ottawa Hunt and Golf Club. “It’s the first time for all of us being at a national competition,” he said. “It’s pretty special. We’re pretty proud to represent the Yukon. Meanwhile, Jody Smallwood’s Yukon women’s rink picked up their second victory of the tournament yesterday afternoon, edging Manitoba 8-7 after their opponent’s last-ditch double attempt went awry. The 38-year-old said her team entered the event hoping to win at least one game and finished playing with house money. Smallwood and company previously beat N.W.T. 7-5 and held a 2-3 record heading into action today. Any hope at a playoff run was lost, however, with a final 10-2 loss to Alberta. Smallwood is joined in Ottawa by third Joan Hyrve, second April Williams and lead Laura Williamson. The group suffered tough losses to both New Brunswick and Northern Ontario before being shut out 13-0 by B.C. yesterday morning. Off the ice, Yukon is holding down third place in a fundraising contest put on by the Travelers. The event is collecting donations from club members across the country for the Curling Canada Rocks and Rings program intended to help children discover the sport. Whitehorse is about $1,500 back of first place. If the club moves to first by tomorrow afternoon, the local curling club would earn a $6,000 grant for facility improvements. 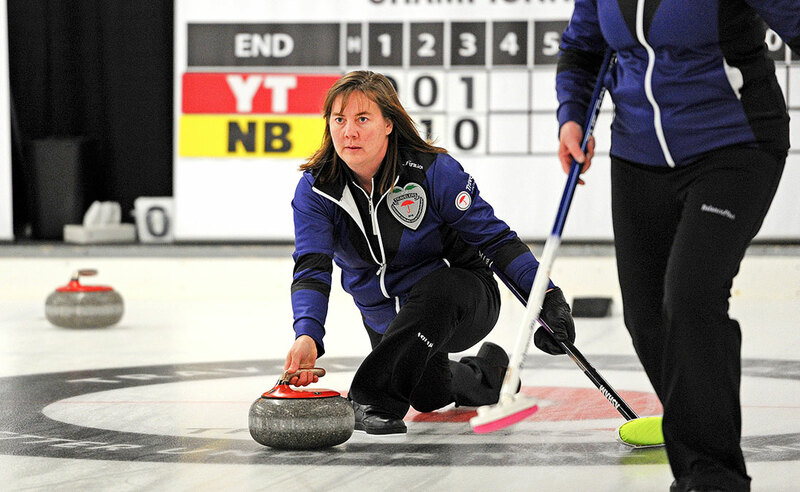 NOTE: In non-Yukon news, Prince Edward Island’s women’s rink, skipped by Lisa Jackson, scored the first eight-ender in Canadian championship history in the first end of their game against Nunavut last night. The game ended in a 21-0 victory for the Cornwall-based rink.